CANBERRA, Australia — Australia said Monday that it would negotiate a security treaty with Vanuatu, weeks after the Australian prime minister warned China against building a military base in the South Pacific island nation. "We agreed to commence negotiations on a bilateral security treaty on common security interests, such as humanitarian assistance and disaster response, maritime surveillance and border security, police and defense cooperation," Turnbull said in a statement. Turnbull said at the time that Australia "would view with great concern the establishment of any foreign military bases in those Pacific island countries and neighbors of ours." New Zealand Prime Minster Jacinda Ardern had said her country takes "a strong position in the Pacific against militarization." 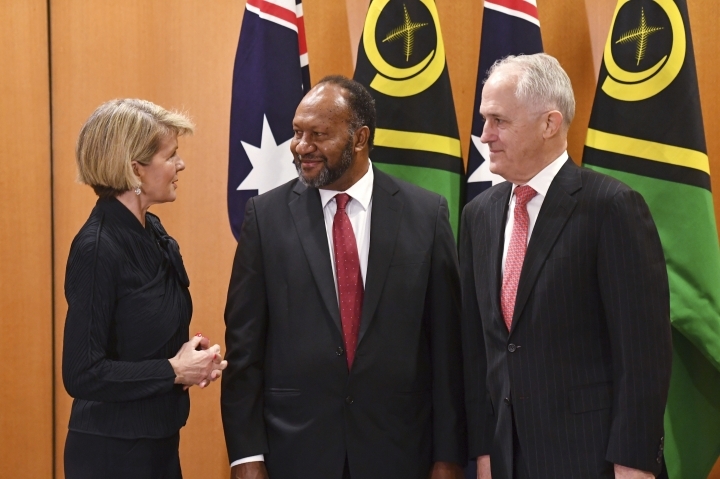 Vanuatu's infrastructure minister, Jotham Napat, told Australian Broadcasting Corp. last week that Salwai would use his Australian visit to ask Turnbull for Australia to help pay for a high-speed telecommunications cable from Sydney to Vanuatu. The request follows the Australian government's announcement last week that it would pay most of the 137 million Australian dollar ($101 million) price tag for such an undersea cable to South Pacific neighbors Papua New Guinea and Solomon Islands. Australia stepped into that project after the Solomons' government signed a contract with Chinese telecommunications giant Huawei in 2017 to build a cable to the Sydney broadband hub. The Solomons consequently scrapped the Huawei deal.